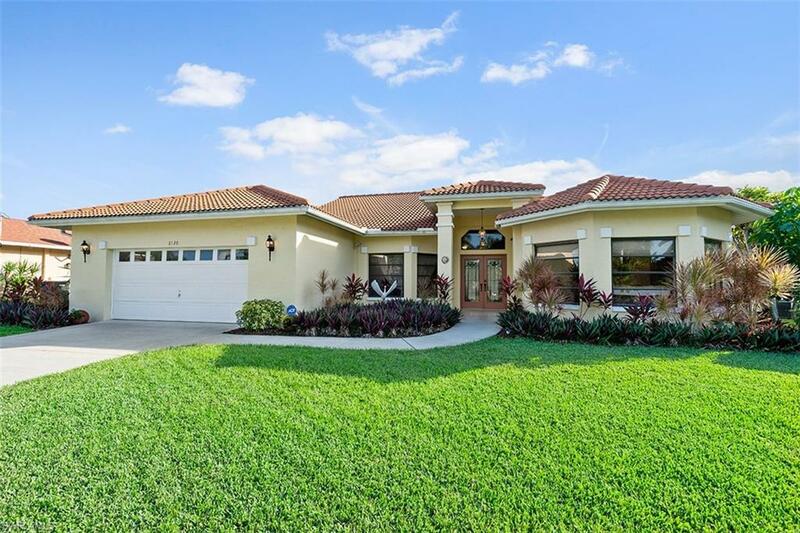 H.13815 - Located in a desirable Cape Coral location. This quiet neighborhood is well maintained with palm tree-lined streets. You wonât believe the size of this home! Enjoy your waterfront home on a freshwater canal with over 2, 700 sqft of living space! This 3 bed + den, 2 bath pool home has a BRAND NEW A/C unit and a NEW tile roof that was installed in 2016. The kitchen has granite counter tops with a center island and breakfast bar. The home consists of vaulted ceilings, formal dining room, and tile throughout except carpet in guest bedrooms. There are multiple family rooms for entertaining! The location gives you access to intersecting canals that lead to freshwater lakes and amazing sunsets thanks to the Southern exposure. Enjoy these sunsets on your outdoor lanai area with multiple seating areas! Oversized garage with well-manicured landscaping and green grass! Water and sewer assessments are paid in FULL. Close to Publix, Golf Courses, Parks, High School and Elementary School. Downtown Fort Myers is 13 minutes (6 miles) and downtown Cape Coral is 15 minutes away (7 Miles). You wonât want to miss this home! Make your appointment today!